In this first-ever showcase of his work, Gregory Heisler, one of professional photography's most respected practitioners, shares 50 iconic portraits of celebrities, athletes and world leaders, along with fascinating, thoughtful, often humourous stories about how the images were made. From his famously controversial portrait of President George H.W. Bush (which led to the revocation of Heisler's White House clearance) to his evocative post-9/11 Time magazine cover of Rudolph Giuliani, to stunning portraits of Julia Roberts, Denzel Washington, Hillary Clinton, Michael Phelps, Muhammad Ali and many more, Heisler reveals the creative and technical processes that led to each frame. 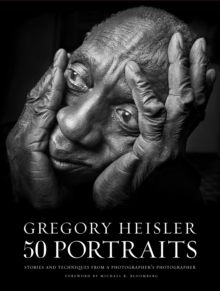 For Heisler's fans and all lovers of photography, Gregory Heisler: 50 Portraits offers not only a gorgeous collection of portraits, but an engrossing look at the rarely seen art of a master photographer at work. It comes with a foreword by New York City mayor Michael R.